Fun Minnie Mouse Cupcakes are perfect for a birthday party! 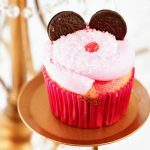 If the Mouse House is one of your favorites destinations then you'll definitely want to make these fun cupcakes to share! Start with cupcakes that have been baked and cooled. Load the frosting in a large piping bag with a #12 or #24 tip. Add a small dollop of icing to the top of each cupcake. Starting on the edges work your way around the cupcake finishing at the top with a swirl. Add the iridescent sprinkles to a small bowl. Turning the cupcake upside down lightly press them into the sprinkles. Insert an Oreo for each ear and a red candy for the nose. Refrigerate until ready to serve!